We are pleased to celebrate the one-year anniversary of Kennedy Ryan’s debut, WHEN YOU ARE MINE! To say that I’m a person who loves to read about love triangles is a vast understatement. I love to be immersed into the emotions of each character. I want to root for both couples. I need to see the good in all characters, understand their emotions leading up the final choice. There is just something about taking the ride, learning about all points of the triangle that draws me in every time. 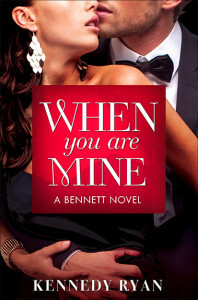 I have to say, When You Are Mine by Kennedy Ryan, was one heck of a ride! I enjoyed it from beginning to end. It was a fast-paced read with a vivid cast of characters. Ms. Ryan pulled me into the world of Walsh, Cam, and Kerris. I felt like I was in the thick of the action. Walsh was the quintessential golden boy—handsome, rich, and educated. Cam was the man who came from nothing and made a good life for himself. Kerris and Cam had similar experiences in life. They both grew up in the foster care system, they both had gone through unspeakable things. The relationship between Kerris and Cam seemed to be a perfect match—until Walsh entered the picture. While Cam is the man Kerris feels she needs, Walsh is the man Kerris wants. They connected instantly, the attraction was sizzling, and I was hooked from their first meeting. When You Are Mine will tug at your heartstrings and take you on a journey. I laughed, cried, cheered, and shouted. Mr. Ryan did an amazing job! Click HERE for update on where life is now…MAJOR SPOILERS!!! Bonus material only for those who have read books 1 and 2!!! Kennedy Ryan always give her characters their happily ever after, but loves to make them work for it! It’s a long road to love, so sit back and enjoy the ride. In an alternative universe, she is a wife to the love of her life, mom to a special, beautiful son, and a friend to those living with autism through her foundation serving Georgia families. Her writings on Autism have appeared in Chicken Soup for the Soul, and she has been featured on the Montel Williams Show, NPR, Headline News and others. Ryan is donating a portion of her proceeds to her own foundation and to her charitable partner, Talk About Curing Autism (TACA).